A quick run-down of features we are planning to add during the second quarter of 2017. Thank you for your continued support and feedback (and patience). If you have any comments, please don’t hesitate to contact me. Ability to pre-slug answer sheets with student name and ID. Premium keys for CollegeBoard’s SAT #5, #6, and #7 are now available. Once these keys are installed in your OnlineScoreTracker account, student reports of tests graded using these keys will print with a detailed Test Question Breakdown on pages 2 and 3. Just find the key you want and click on the PREMIUM link. If you haven’t already, you will also need to upload our list of categories and category groups. This is done through the KEYS menu. 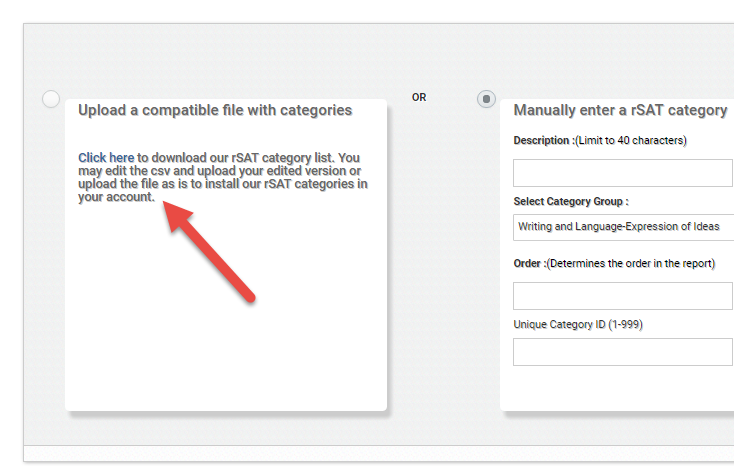 Select the rSAT categories then click ADD and click on the link to download our list of categories, edit this file if desired and then upload it again to install it in your OnlineScoreTracker account. If you need help, we can do this for you via our Key Installation Service.